A tank goes into battle in The Battle Ancre and Advance of the Tanks (Britain: British Topical Committee for War Films, 1917); Imperial War Museums. He doesn’t know that he is a cinema fan, and that is the crux of the trouble – he is ignorant of the great American language. I gather from his pathetic note that he is a regular patron of the “silent drama,” yet he finds a difficulty in understanding the explanatory inscriptions with which American producers seek to help the intellects of those who sit in the outer darkness. Whatever about the coming disappointment, anticipation for the film could build on tantalizing glimpses of this new war machine that had been accumulating for several months. In autumn 1916, Irish people had read about the first battlefield deployment of tanks, and in November 1916, Dubliners had even had the opportunity of seeing a tank film, albeit it the animated Tank Cartoon (Britain: Kineto, 1916). 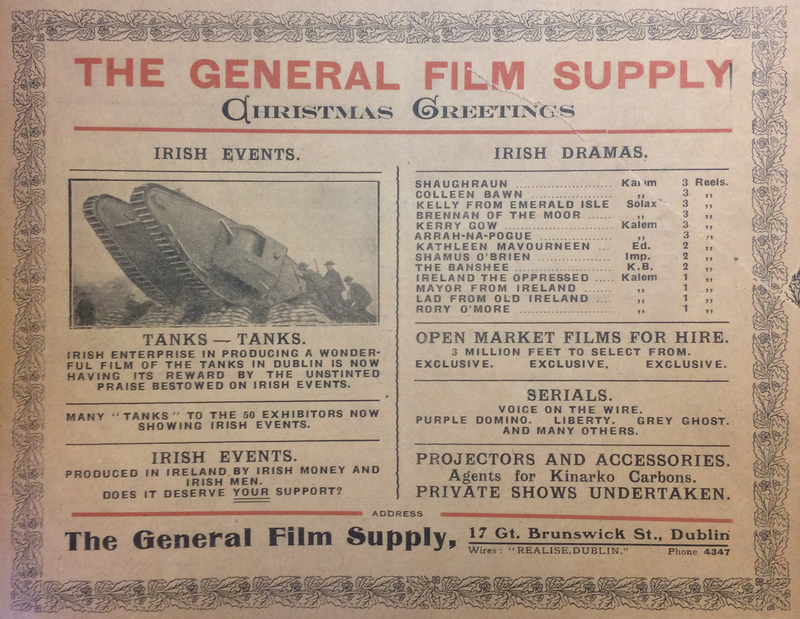 The cinema trade press had also informed its Irish readers about the shooting of the War Office tank film (“About Those Tanks!”). 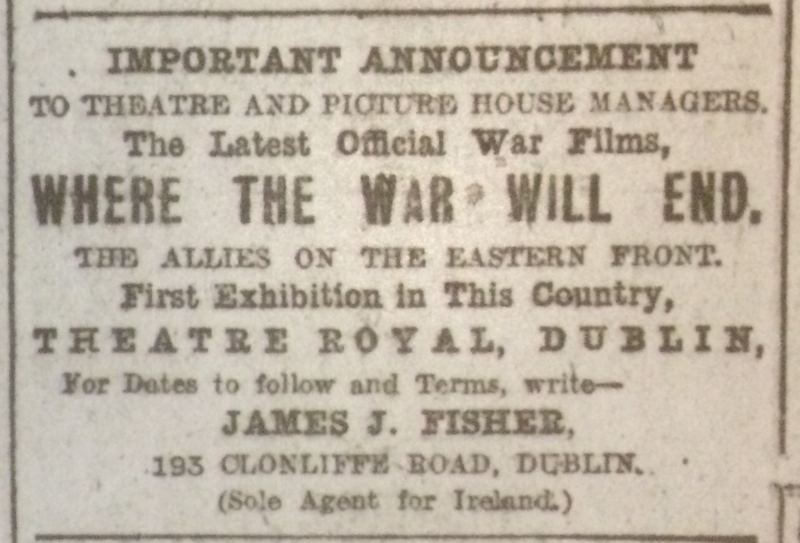 The Dublin Evening Mail appears not to have been exaggerating when it noted that the “coming of the “Tanks’ Film’ to Dublin has been eagerly anticipated.” Publicity for the film could draw on what appears to have been a widespread fascination with this new weapon, in a similar way to which the earlier propaganda films had focused on artillery or aircraft. 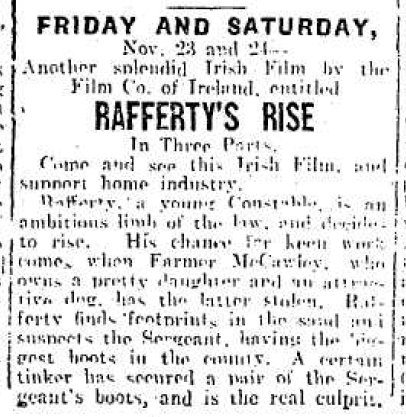 Previewing the coming shows at Dublin’s Theatre Royal, the city’s largest entertainment venue, the Mail writer observed that the “film portrays the most interesting happenings during the Battle of the Ancre, when the Tanks were first heard of, and promises to prove one of the most successful of the many interesting war films already seen in Dublin. The Battle of the Ancre stands out as one of the most striking phases of ‘The Big Push’” (“‘The Tanks’ at ‘The Royal’”). Indeed, the Royal starting advertising the film as early as 10 February, when a short item warned patrons to book the film to avoid disappointment: “Your remember the trouble you had getting a seat at the ‘Battle of the Somme’ films, but you say to yourself that there will be no difficulty with ‘The Tank’ films, and you delay booking only to find yourself in the same position as before” (“‘The Tanks’ Film at the Theatre Royal”). 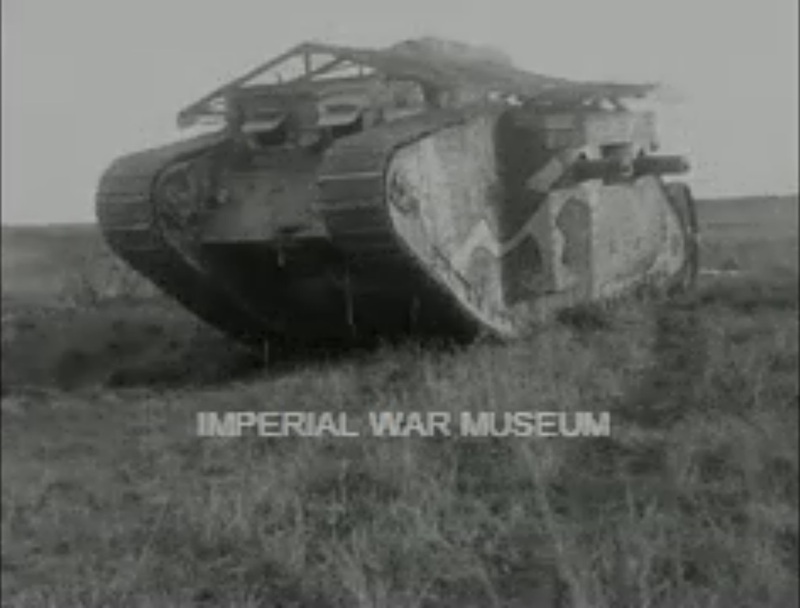 The added attraction of The Tanks was that it included footage of Irish soldiers: “There were no Irish regiments shown in the Somme film, but Lieut. 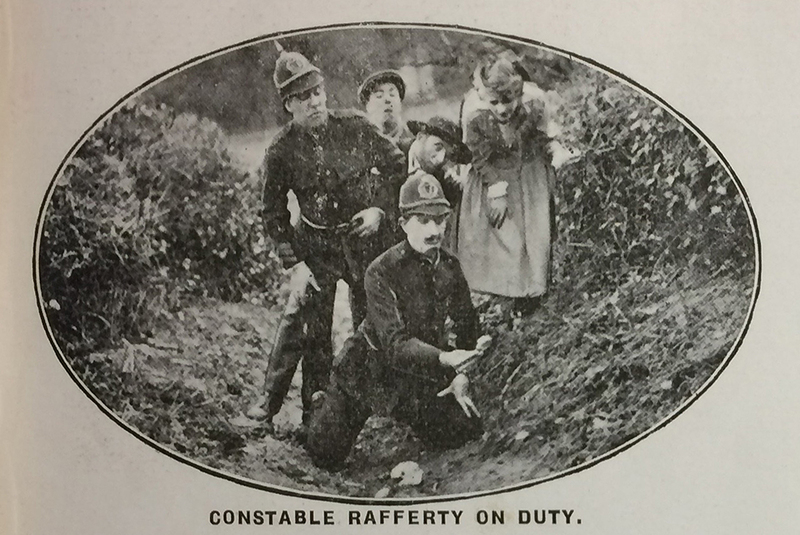 Malins, who took the pictures, succeeded in getting some splendid films of our gallant Irish Brigade.” Despite such extensive publicity of the film, the Royal only showed it at matinees (beginning at 2.30pm), except on Wednesday, when the film replaced the Royal’s two evening variety shows (beginning at 6.45pm and 9pm). 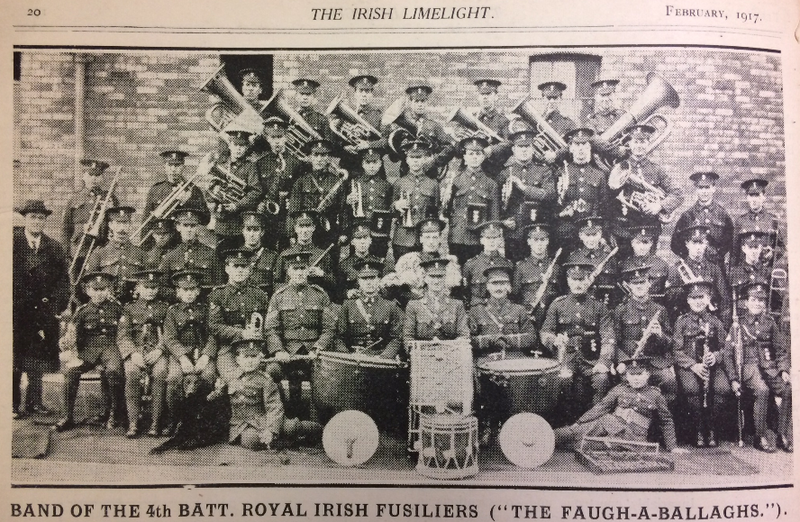 Nevertheless, the film was presented at the Royal with “special music and effects that […] should help one to realise ‘what it is like.’ The band of the famous Faugh-a-Ballaghs will play at every performance” (“‘The Tanks’ at ‘The Royal’”). Unfortunately no review of the Royal shows appears to exist that specifies what effects – presumably sound effects imitating exploding shells – were used during the shows and how the audiences responded. Dublin Evening Mail 19 Feb. 1917: 2. The Royal was far from the only Dublin venue showing the film that week. Another large theatre, the Empire, showed the film all week alongside a somewhat reduced variety programme. 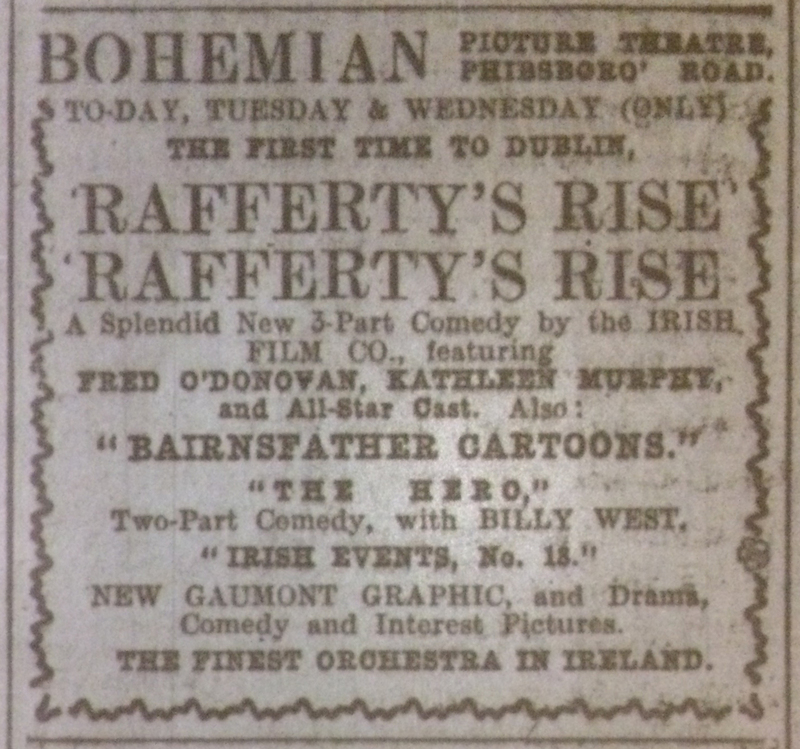 Several of the most prestigious picture houses also screened it, with the Bohemian, Carlton, Masterpiece and Town Hall, Rathmines showing it for the first three days of the week, and the Grafton retaining it into the second half of the week. The Bohemian managed to show the film four times daily at 3, 5, 7 and 9, but this was eclipsed by the six shows that the Grafton managed to squeeze in at 1.45, 3.15, 4.45, 6.15, 7.45 and 9.15, “so that business men and others can all have an opportunity of making acquaintance with these new machines of war, of which Sir Douglas Haig says he cannot speak too highly” (“Grafton Picture House”). Dublin Evening Mail 24 Feb. 1917: 2. The Times did not usually offer extensive reviews of films, but other newspapers were taking cinema increasingly seriously. On 19 February, the Evening Telegraph – the evening edition of the Freeman’s Journal – resumed publication after a hiatus caused by the destruction of its premises during the Easter Rising. 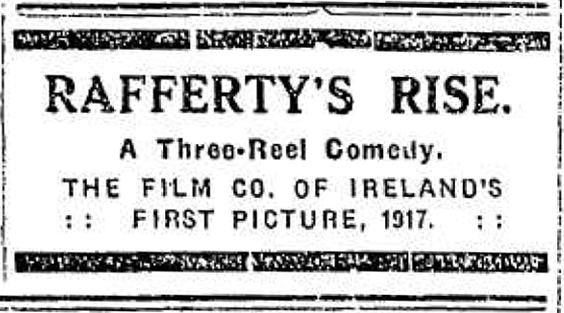 Among its innovations was a Saturday column entitled “Kinematograph Notes and News.” The first series of notes on 24 February included both international items and some of particular Irish relevance. 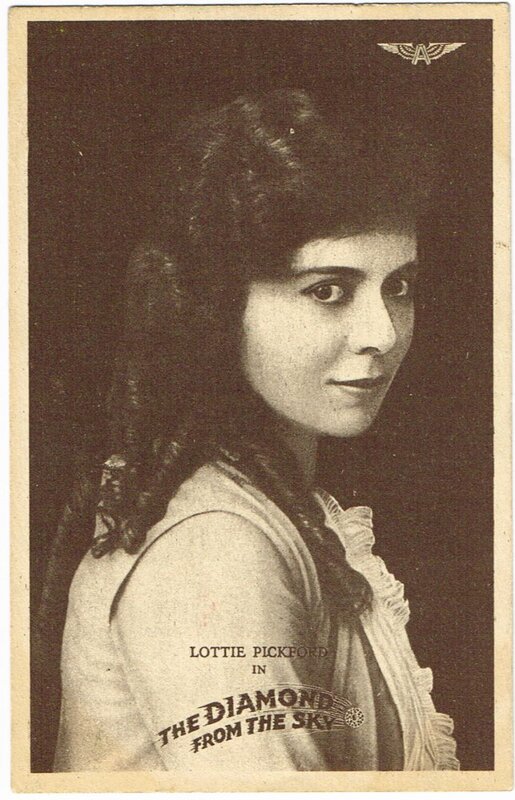 The latter included a notice that Aurele Sydney, star of Ultus series, would attend the Masterpiece Cinema during the following week’s screenings of Ultus and the Secret of the Night (Britain: Gaumont, 1917). Another note concerned the views of John Bunny, a film star who had visited Ireland five years previously and discussed the possibilities for film production in the country. 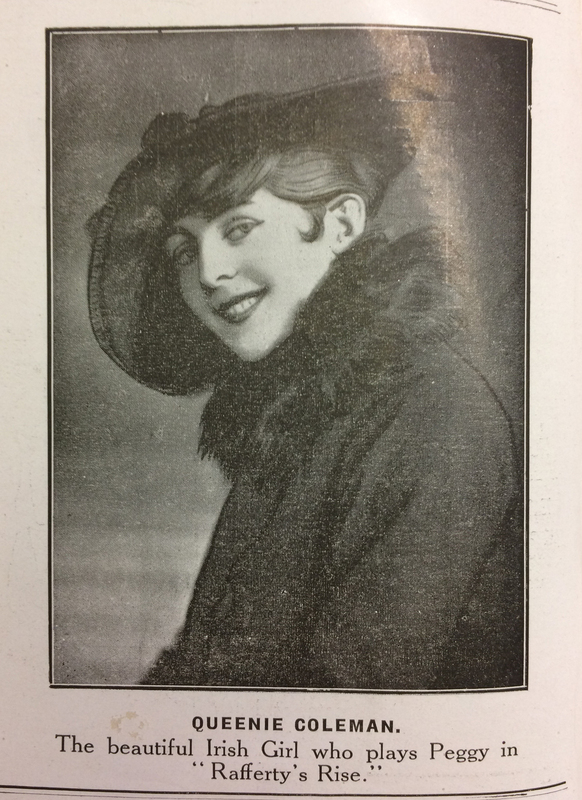 Given that it made no mention of the Film Company of Ireland’s recent filmmaking efforts, the reason for the inclusion of the note on Bunny is unclear, unless it was to quietly contradict the claim made in the Masterpiece’s ad that Sydney was the first cinema star to visit Ireland. 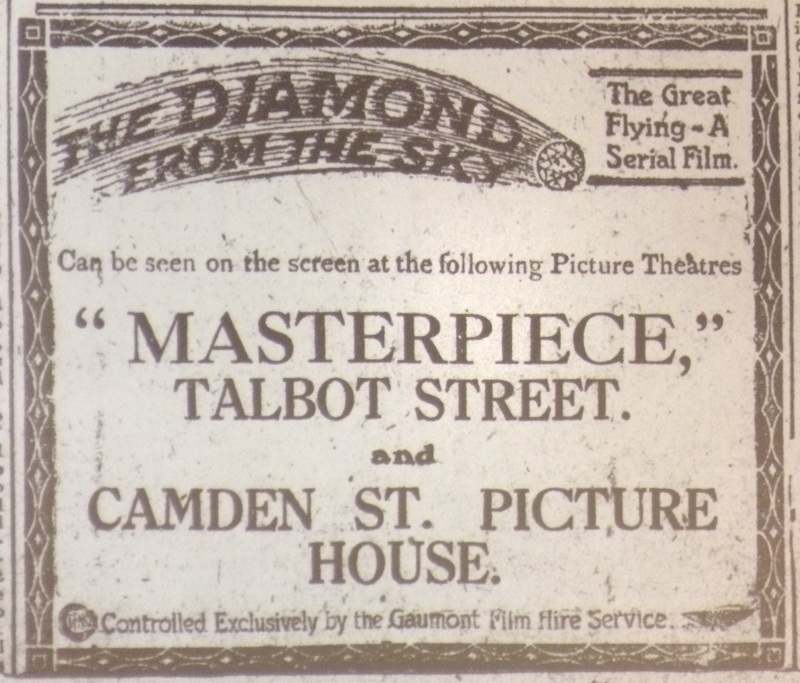 Despite Senix’s optimistic reading of the appearance of the Telegraph‘s column, bitter attacks on cinema were still very much evident in February 1917, both in the press and in the auditorium. 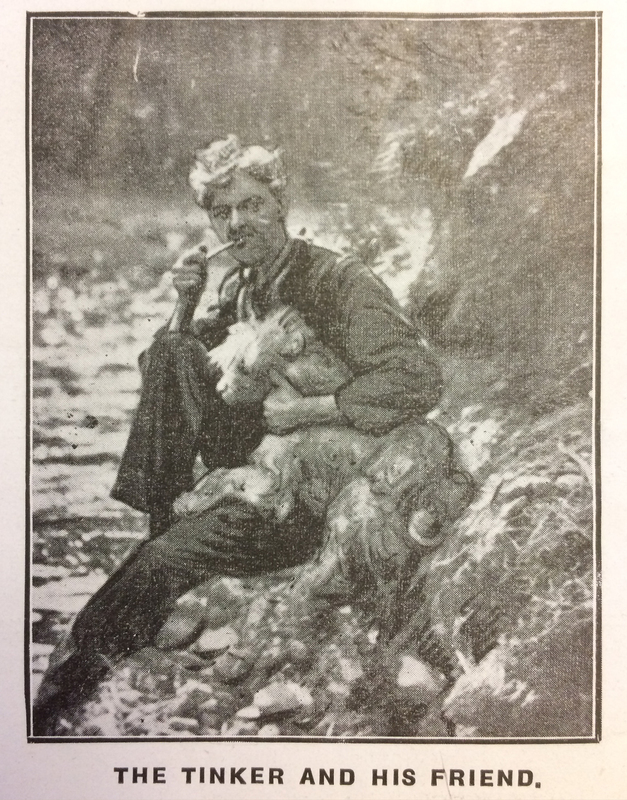 When the “Gossip of the Day” columnist had attempted to define “cinema fan” for his/her readers, s/he speculated that “‘fan’ must be American for ‘fanatic,’ as it is used to designate people who are peculiarly addicted to any pastime.” However, there may be reasons for distinguishing between cinema fans and cinema fanatics. Certainly serial protestor William Larkin was a fanatic often to be encountered in cinemas but not a cinema fan. Since 1914, Larkin had mounted periodic protests in Dublin’s picture houses against films that he and the Catholic Irish Vigilance Association (IVA) considered to be morally dubious. These protests occurred in the auditorium during the screening of the films and involved Larkin shouting about the need for a Catholic-influenced Irish censorship and/or throwing ink at the screen. Larkin sought arrest to magnify the reach of the protest through the newspaper reports of the disturbance and subsequent trial. He had usually found that the magistrates treated him leniently – even indulgently – but in December 1915, he had been jailed when he refused to pay a fine imposed for a cinema protest. After a period of apparent inactivity during 1916, Larkin’s latest – and last for some years – cinema protest took place on 21 February 1917 during a screening of The Soul of New York (US: Fox, 1915; released in the US as The Soul of Broadway) at the Pillar Picture House in Dublin city centre (“City Cinema”). It followed a well-established pattern. At about 10.25pm, the picture-house porter heard a commotion in the auditorium, found that Larkin had thrown “a blue liquid” at the screen and went to get manager J. D. Hozier. Larkin made no attempt to escape and admitted to having thrown the liquid, which not only caused damage estimated at £30 to the screen but also “bespattered” the instruments and clothes of musicians Herbert O’Brien, Joseph Schofield and Samuel Golding in the orchestra (“City Cinema Scenes”). After several court appearances, the case seems to have been struck out at the end of March. Evening Telegraph 22 Feb. 1917: 1. 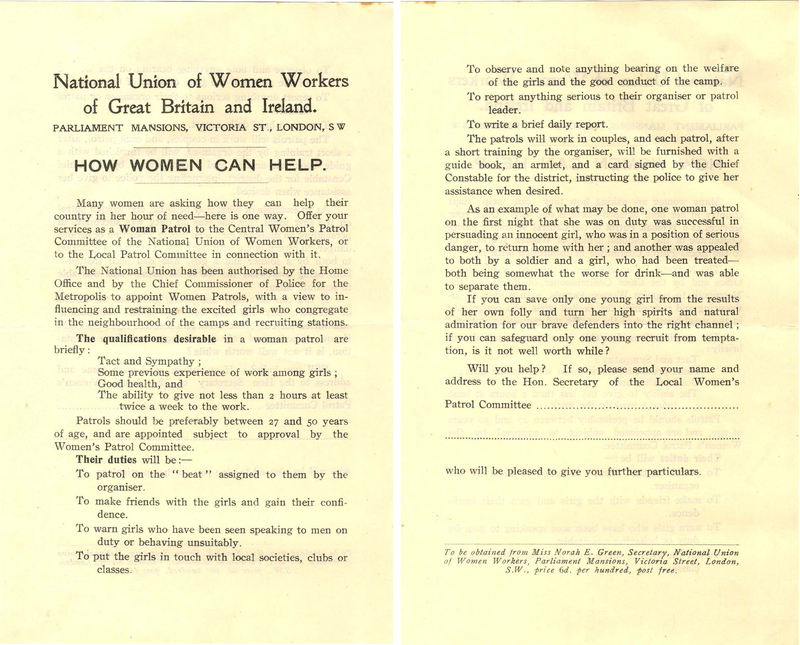 Although this “exciting episode” certainly garnered press coverage, how Larkin’s direct-action methods complemented the Irish Vigilance Association’s ongoing campaign for cinema censorship is not clear. Indeed, despite his previous affiliation with the IVA, Larkin may have been acting on his own in this instance. The IVA’s well organized political lobbying for the introduction and effective exercising of film censorship was well advanced by February 1917. 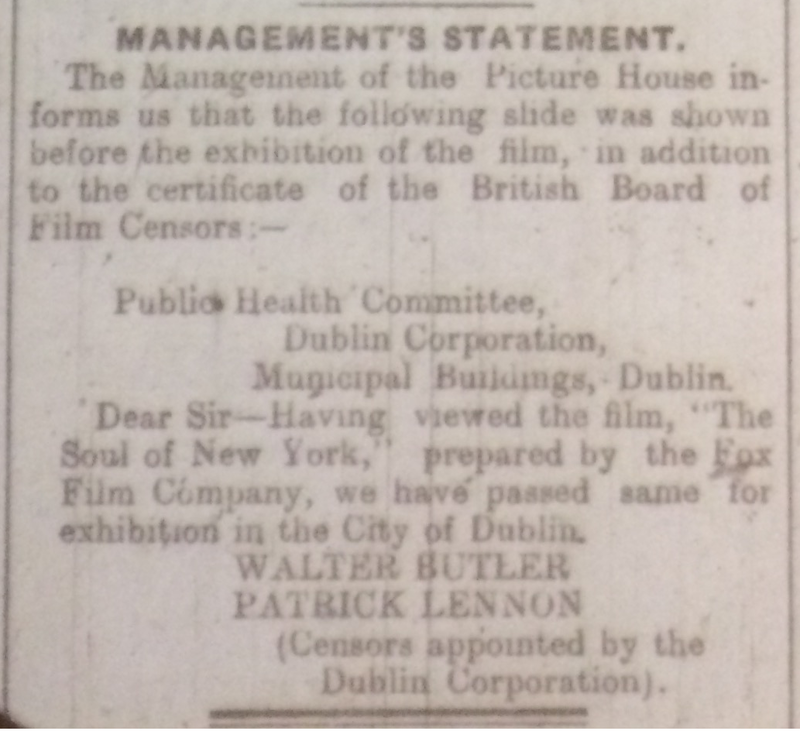 In June 1916, Dublin Corporation had appointed Walter Butler and Patrick Lennon as film censors, and in January 1917, it had engaged two women as “lady inspectors” of picture houses (“Amusement Inspectors,” “Dublin Lady Censors”). The IVA found a ready welcome at Dublin Corporation. On the last day of February, its Public Health Committee (PHC) invited a seven-member IVA deputation to address them on Sunday opening (“Cinema on Sundays”). Answering the deputation’s complaint that many cinemas opened at 8 o’clock on Sunday evenings, thereby intruding on hours set aside for Catholic devotions, PHC chairman and former mayor Lorcan Sherlock assured the deputation that the Corporation would enforce a 8.30pm Sunday opening. 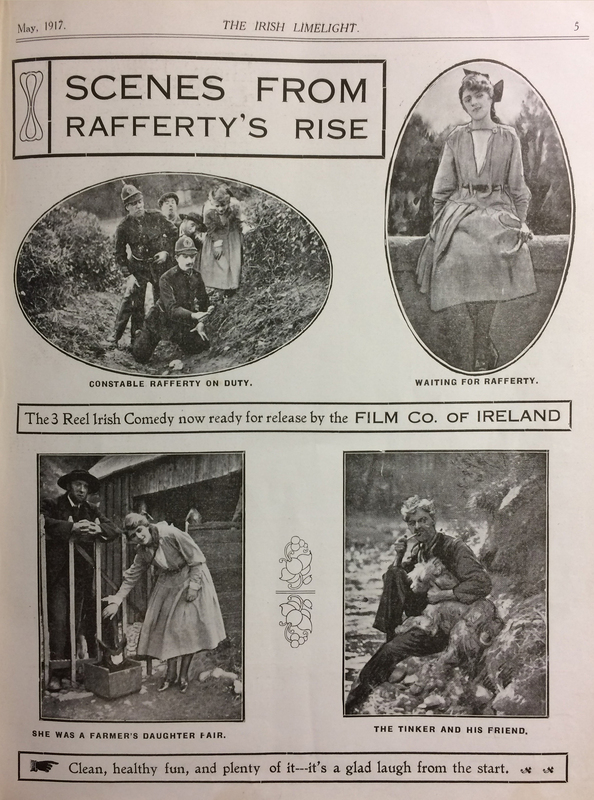 Therefore, Irish cinema was engaging both fans and fanatics in February 1917. “About Those Tanks! Extraordinary Interest of the Latest ‘Big Push’ Films.” Bioscope 12 Oct. 1916: 121. “Amusement Inspectors: Reports to Be Made on Dublin Performances.” Evening Herald 10 Jan. 1917: 3. 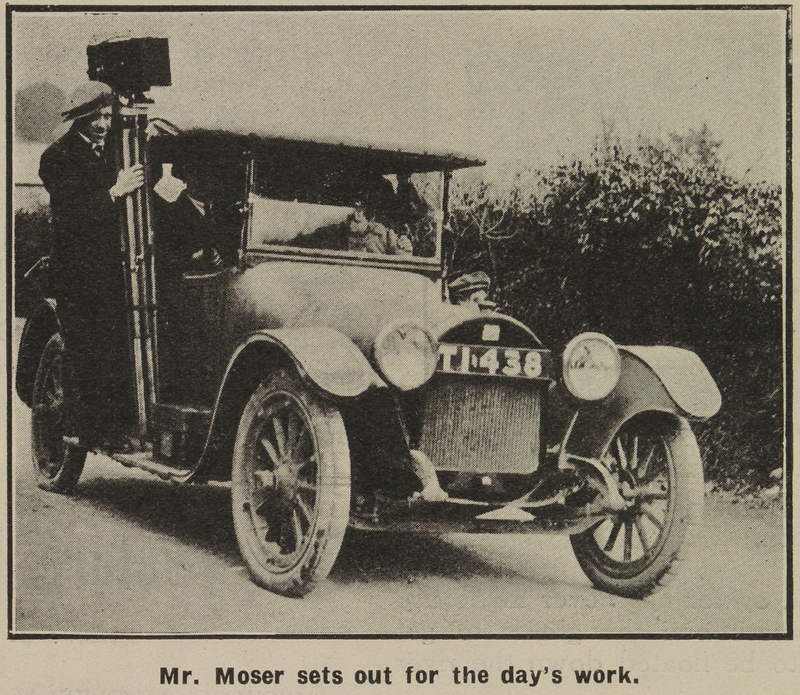 “Cinemas on Sundays: Vigilance Association and the Hours of Opening.” Evening Telegraph 1 Mar. 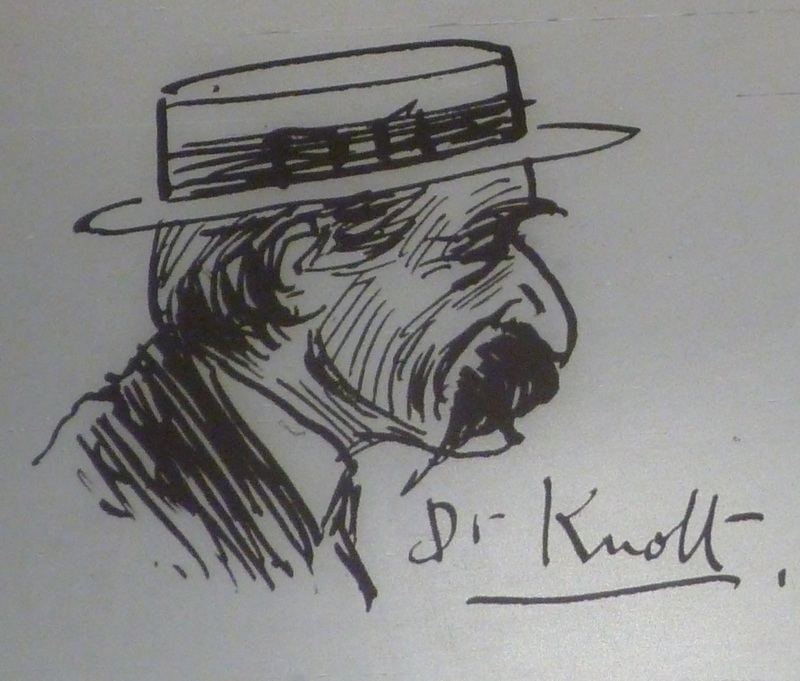 1917: 2. City Cinema: Exciting Episode: Blue Liquid Thrown.” Evening Telegraph 22 Feb. 1917: 1. 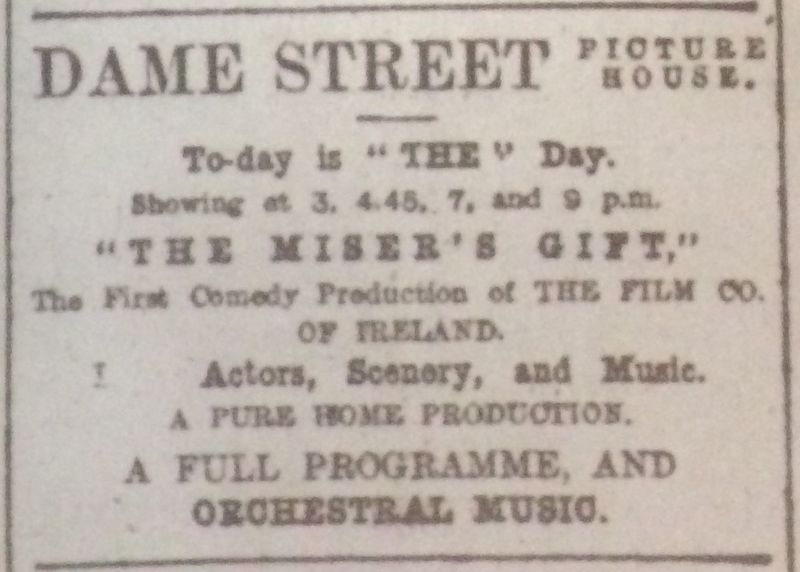 “City Picture-House Scene.” Dublin Evening Mail 28 Feb. 1917: 2. “Dublin Lady Censors: Names Submitted.” Freeman’s Journal 15 Jan. 1917: 4. “Grafton Picture House.” Dublin Evening Mail 17 Feb. 1917: 5. “Kinematograph Notes and News.” Evening Telegraph 24 Feb. 1917: 5. The Man About Town. “Thing Seen and Heard.” Evening Herald 19 Feb. 1917: 2. Senix. “Movie Musings.” Irish Limelight 1:3 (Mar. 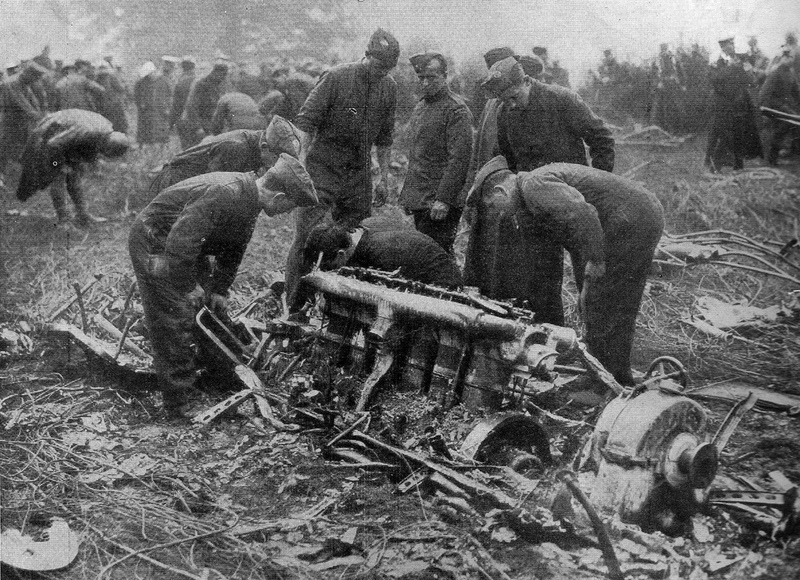 1917): 3. “‘The Tanks’ at ‘The Royal.’” Dublin Evening Mail 17 Feb. 1917: 4. “‘The Tanks’ Film at the Theatre Royal.” Dublin Evening Mail 10 Feb. 1917: 5. “‘Tanks in Action’: Cinema Pictures in Dublin.” Irish Times 20 Feb. 1917: 3.